« "365 (on the move again)"
Sat 24 September 2011 "Published"
One of my ambitions for the year was to submit a photograph for publication to a magazine. Haven’t quite got around to that yet, but one of my photos was published in this week’s Harrogate Advertiser. The text is sort of 80% based on what I sent to. Sadly the paper don’t pay anything for ad-hoc submissions (no top up for my macro lens fund), but stil nice to be in print! 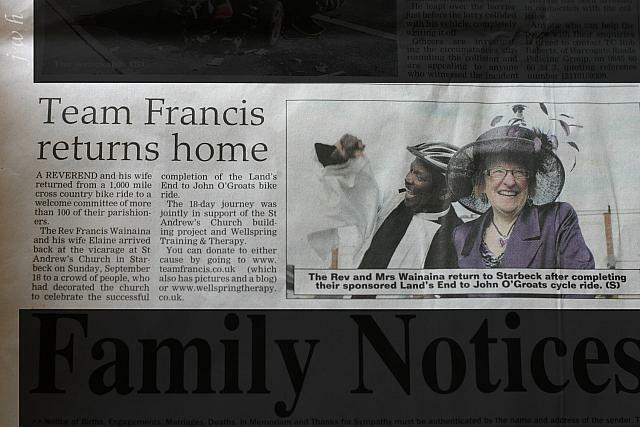 The wind, rain, and floods gave way to autumn sunshine as the Rev’d Francis and Mrs Elaine Wainaina cycled down one last hill from the Vicarage to St Andrew’s Church in Starbeck on Sunday, where a crowd of over a hundred parishioners had gathered to celebrate the successful completion of their Lands End to John o’Groats cycle ride. Balloons and banners decked the church, and BBC Radio York interviewed the couple live on air as the church bell tolled their safe return. Despite having just cycled 1,000 miles in 18 days, the couple looked fresh and happy – and were even talking about what the next one might be! The ride was jointly in support of the St Andrew’s Church building project and Wellspring Training & Therapy, and is it not too late to donate via www.teamfrancis.co.uk (which also has pictures and a blog) and www.wellspringtherapy.co.uk.